Terracotta Roof Tile cleaning using high pressure equipment – before and after images. If your roof, driveway or paths require cleaning, contact Melbourne Roof Cleaning and Restoration for an obligation FREE Inspection and Quote. 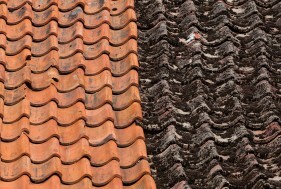 Our expert roofing specialists will advise on the recommended terracotta roof tile cleaning process to get your roof back to its original condition. Melbourne Roof Cleaning and Restoration care as much about your roof as you do. You can rely on our roofing experts for a Tailored Roof Cleaning Solution, based on your individual requirements. Quality Roof repairs and ongoing maintenance are essential for keeping the roof over your head and protecting your family from the extreme Melbourne climate.